The farm place of Wayne and Ellen Gaskins Putnal was located on the south side of Ray City, on Park Street. Wayne Putnal worked the farm during the week and on Saturdays he could be found in town at Leon Bradford’s barbershop. The barbershop was located on the south side of Main Street just opposite the Victory Soda Shop. Mr. Putnal worked many years there, cutting hair and giving shaves. In his later years he had a noticeable tremble, but his customers could always be confident that he would apply scissors to locks or straight razor to whiskers with the steadiest hand. There were seven children in the Putnal household, and they attended the Ray City School. They would walk up the dirt road that was Park Street to Johnson Street, then east to the school, joining the other farm children who lived along the way. Leston Putnal married Louise Cooper after graduating from Ray City High School. During WWII, he joined the Air Force, and it became a 30 year career. While he was away during the war his wife and son rented an apartment in Effie Guthrie Knight ‘s house on Park Street. The large old house had once served as a hotel for tourists visiting the Mayhaw Lake Amusement Park. Later, Leston Putnal and his family lived in Adel, GA.
After high school, the sisters Grace and Nelda Putnal went to Jacksonville, Florida. Nelda got a job as an operator for the Standard Oil Company and in 1947 she married Charles J. Vance. Grace Putnal found work as a bookkeeper. She married Bobby Earnest in Duval County, Fl in 1953. Cary W. Putnal moved to Macon, GA.
Earl Putnal was known to other Ray City students by the nickname, “Guinea.” Like his older brother, Earl fought in WWII. He served in the Navy and was wounded in action. After the war, he returned to Ray City and married Helen Marie Lee. She was the daughter of Letha Brantley and Loren Lafayette Lee. Earl and Helen moved to Jacksonville, where Earl took a job as a clerk with Spencer Electric company. Later, they moved to Galveston, TX where Helen’s parents had already relocated. Dorothy Putnal married Payne Webb, a successful merchant of Ray City. He owned a liquor store located on the south side of Main Street, opposite the present day location of the Dollar General store. The couple spent their honeymoon in Atlanta, and returned to Ray City to make their home. After marriage, Dorothy went on to attend Georgia State Womans College at Valdosta, GA (now Valdosta State University.) After Payne died of cancer she relocated to Atlanta and remarried. Glen Putnal became a dentist. The Putnal house on Park Street is long gone, but the town home still stands on Jones Street in Ray City, GA.
Leston L. Putnal, son of Ellen Gaskins and Wayne Putnal, grew up in Ray City, GA. He died December 11, 2006 at Adel, GA..
Leston L. Putnal, 86 of Adel passed away Dec. 11, 2006, at Memorial Convalescent Center. He was born on July 23, 1920, in Willacoochee to the late Wayne and Ellen Gaskins Putnal. He grew up in Ray City and lived in Adel for the past 20 years. He was retired after 30 years in the Air Force as master sergeant and also retired from Southern Chemicals in Macon. He is survived by his wife, Louise Cooper Putnal of Adel; one son, Gene Putnal of Adel; one grandson, Eric Putnal, Port St. John, Fla.; one brother, C.W. Putnal, Macon; two sisters, Nelda Vance, Jacksonville, Fla., Dorothy Davis, Atlanta; one sister-in-law, Laverne Putnal, Adel; and numerous nieces and nephews. He was preceded in death by one sister, Grace Ernest; and two brothers, Earl and Glen H. Putnal. Funeral services will be held at 2 p.m., Wednesday, Dec. 13, 2006, at First Baptist Church with the Rev. Ben Smith officiating. Burial will be held in Woodlawn Memorial Gardens. Boone-Lipsey Funeral Home, Adel. 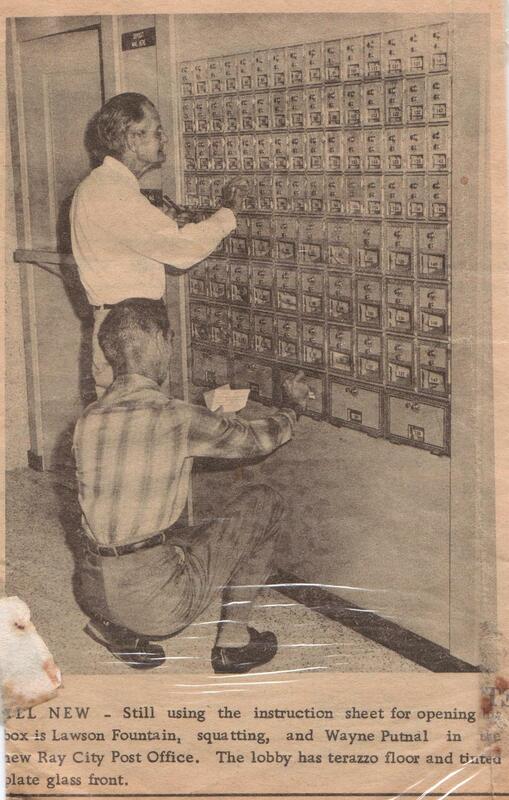 Wayne Putnal & family were long time residents of Ray City, GA.
Wayne Putnal and Lawson Fountain at the Ray City, GA Post Office shortly after it opened. According to U.S. Census records, Wayne Putnal was born and raised in Florida. He was born November 22, 1889 in Jasper, FL, a son of Eliza and Hayden Putnal. Some time after 1910 Wayne Putnal moved to Georgia, where in 1916 he married Ellen Gaskins in Berrien County, GA. Wayne was a man of 26 years, of medium height and slender build, with blue eyes and dark hair. Ellen was the 16 year-old daughter of Mary E. Strickland and Levi J. Gaskins of Rays Mill, GA; their youngest daughter, born August 4, 1899. 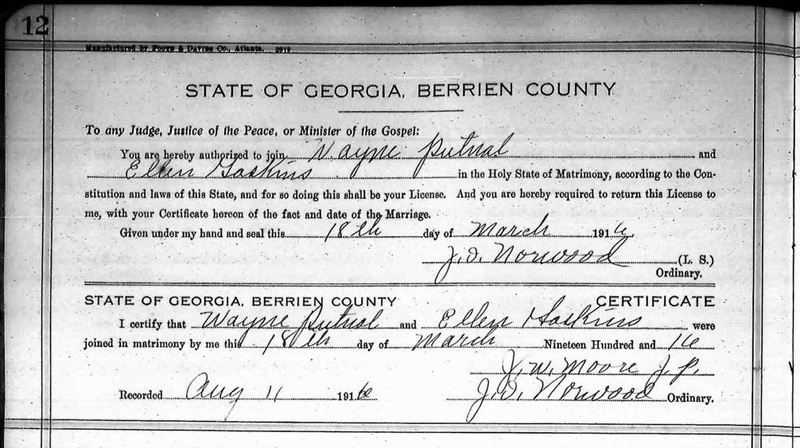 Ellen Gaskins and Wayne Putnal were married on March 18, 1916. by J.W. Moore, Justice of the Peace. Shortly after marriage, the couple moved to West Green, Coffee County, GA where Wayne Putnal went to work as a barber, self-employed. Wayne’s father had passed in 1913, and his widowed mother came to live with the young couple. 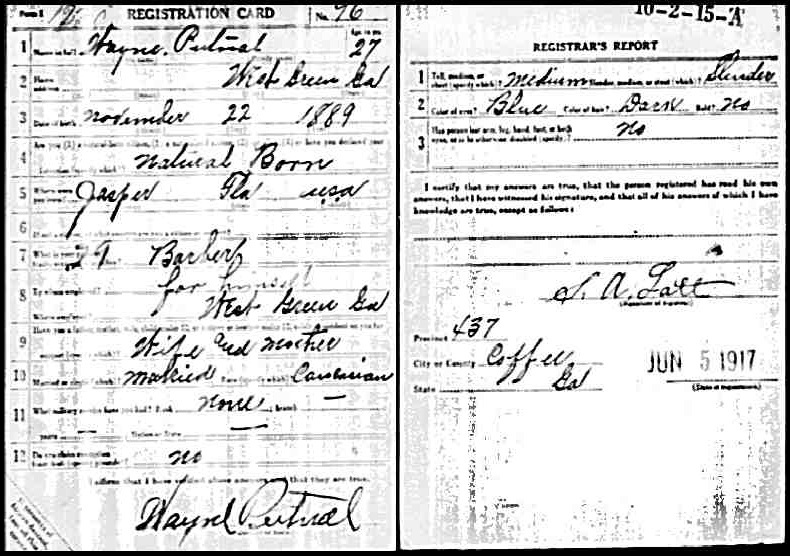 They were living in West Green when Wayne Putnal registered for the WWI draft on June 5, 1917. He was not called to serve in that conflict. By the Census of 1920, the couple had relocated to Willacoochee, GA where Wayne took a wage position in a local barbershop. 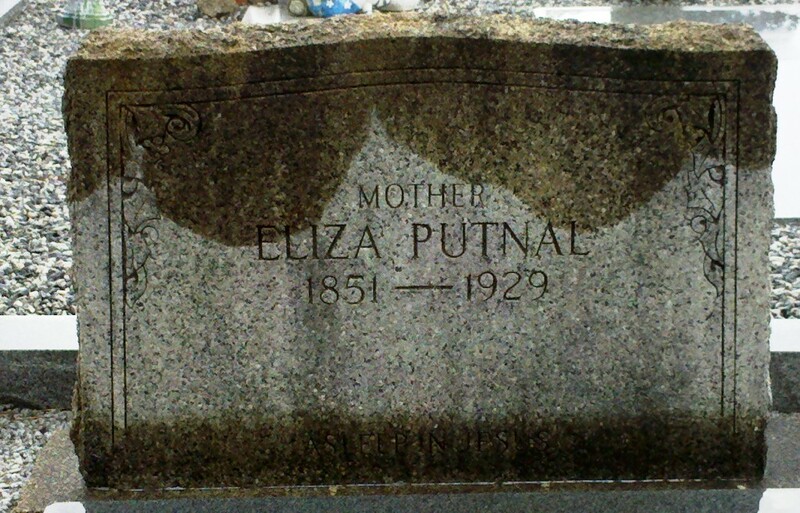 Wayne’s mother, Eliza Putnal, died in 1929, and was buried at Beaver Dam Cemetery, Ray City, GA. In 1930, the Putnals, now with six young children, were living in Georgia Militia District 1329 near Ray City, GA. In the census that year, Wayne gave his occupation as farming on his own account. In their later years, the Putnals moved from their farm place to a house in town. They spent the rest of their lives in Ray City. 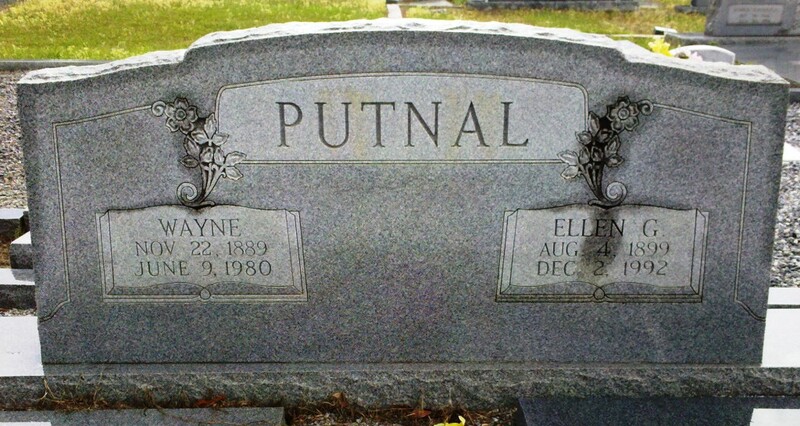 Wayne Putnal died June 9, 1980 and Ellen died December 2, 1992. They are buried at Beaver Dam Cemetery, Ray City, Berrien County, GA.
Wayne and Ellen Putnal, gravemarker, Beaver Dam Cemetery, Ray City, GA.Eliza Putnal, gravemarker, Beaver Dam Cemetery, Ray City, GA. Eliza Putnal, gravemarker, Beaver Dam Cemetery, Ray City, GA.
Eliza Putnal, gravemarker, Beaver Dam Cemetery, Ray City, GA.